Apple’s office applications all get an update. Pages now offers the possibility to publish your own books directly for purchase on Apple Books. 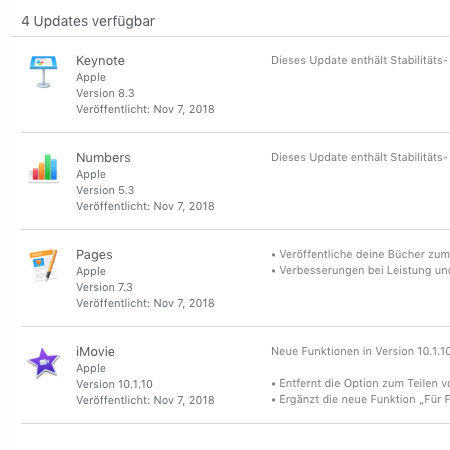 Keynote and Numbers get stability improvements, a welcome service update. The only major change is in iMovie: it is no longer possible to share video files directly on Facebook. However, there is the option “Prepare for Facebook”, so that you can manually upload an exported video to Facebook. It’s a decoupling from the social network, which is an advantage in principle.